Students at the New International School of Thailand (NIST) are collaborating to raise awareness and funds in support of FREELAND’s alternative livelihoods program around Khao Yai National Park. The Bangkok-based students are growing organic mushrooms just like the reformed wildlife poachers that have joined FREELAND’s program at the edge of the World Heritage listed forest in Central Thailand. 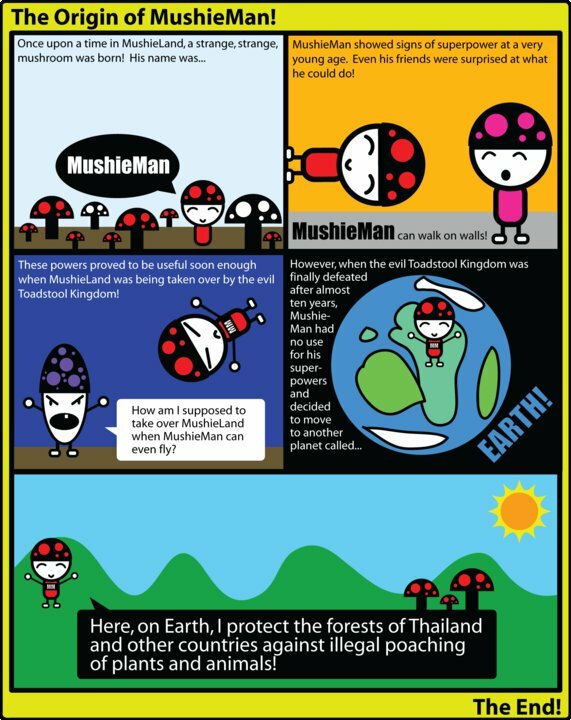 With help from teachers, senior business and arts students created the “Mushie Mushie” brand and comic book hero to promote produce. While younger student farmers are in charge of cultivation, and Food Technology classes assist with cooking. The next mushroom tasting on campus is scheduled for this Wednesday (Dec 8). FREELAND thanks everyone involved at NIST for their creative and inspiring efforts. We wish them bumper crops in their and MushieMan’s quest to help protect endangered wildlife.